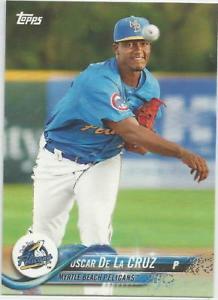 I first became fully aware of the potential of Cubs’ pitcher Oscar de la Cruz in 2015 when he was at Eugene. He was 20 years old at the time as he put up a breakout season striking out 73 batters in 73 innings. For the better part of the last three seasons, though, he’s been fighting off minor injuries that have derailed his career. 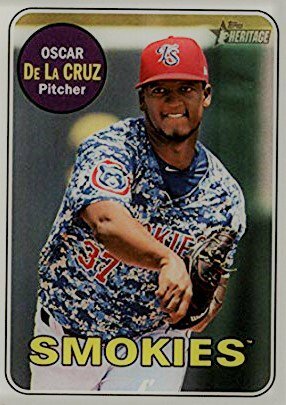 Last July, de la Cruz was suspended 80 games play major-league baseball for violating baseball’s drug policy. He was suspended 80 games after testing positive for Furosemide, a diuretic and masking agent. The Cubs issued a statement which ended with this: “We also expect Oscar to learn from this experience and will support him on his journey back. 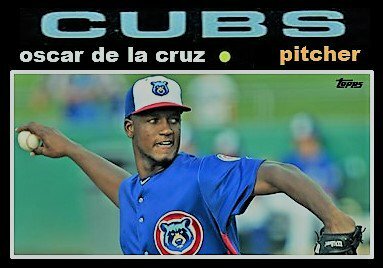 Per Program protocol, the Cubs will not comment further on this matter.” At the time, de la Cruz was on the Cubs’ 40 man roster. Oscar de la Cruz is set to come off his suspension sometime in May. A lot of things can happen between now and then, but I do have a few questions about his future. 1. He has a history of elbow tenderness. I doubt if the Cubs would ever reveal the specifics of why de la Cruz was taking a steroid and tried to mask it. I’m just curious as to what injury he was trying to heal. 2. What role is Oscar going to play this year? Will he be a starter or will he start out as a reliever and work his way back to starter? Will he be a piggyback reliever or will he be a setup man with the possibility of turning into a closer? Considering how much he has been injured the past three summers, a role in the bullpen is not out of question. 3. Just how many innings is he going to get in this year to get ready for the majors? His career high was last year at 77.1 innings. That’s not going to get it done to build up arm strength for the majors. He will be 24 in the spring and if he’s going to be a starter anytime soon, he’s going to have to get 130-140 innings at the MiLB level. And if he does attain that workload, will his arm hold out? 4. At which affiliate is Oscar going to begin the season? There are much more spots available for him in Tennessee. AAA Iowa’s rotation is overflowing but there might be a spot in the bullpen for him there. As for AA Tennessee, if the Cubs want him to be a starter this year, that might be the best place. 5. How much can Cub fans trust him? That’s a good question that works on many levels. Trusting his ability to stay healthy is one way of looking at this question, while trusting him to stay off of steroids is another. For many, the steroid issue is never going to go away. It’s always going to be in the back of their mind. Why he took the steroid is understandable, actually taking it is inexcusable. How the Cubs handle him is not going to be some precedent setting event. However, the actions of the organization in May will reveal just exactly how much faith they still have in him. The Cubs don’t give out 40-man spots willy nilly. Oscar de la Cruz’s talent didn’t go away just because he was suspended for steroids. The ball comes out of his hand so loose it looks like he’s hardly throwing. That perception conflicts with the stress put on his elbow because it doesn’t even seem like he is putting forth much effort to throw 93 to 95 miles an hour. What has been interesting this winter is that the many prospect lists still have him listed. He’s at 15 on Fangraphs while MLB Pipeline placed him at #3. The talent is still there, the questions now will be about his ability to stay healthy and clean .